Location sharing may not grab your attention like a post on Facebook or Twitter, but it’s a darn useful utility for keeping track of family members and friends. 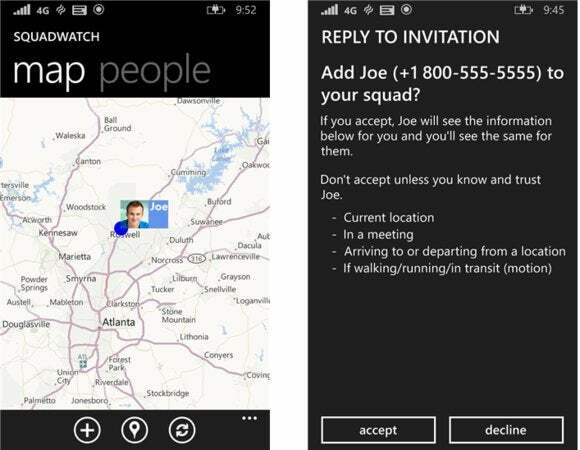 Microsoft’s Squad Watch wants to be that app for Windows Phone, but at this stage, it’s not. Instead, you’re probably better off using Glympse, a cross-platform app that hasn’t been updated in months, but still works on Windows Phone. Squad Watch apparently was originally called “People Sense,” according to WinBeta and other sites, but was released as a Microsoft Garage app for Windows Phone 8.1 only this week. The premise is fairly simple: Squad Watch lets you share your location with members of your “squad,” i.e. friends and family. It also peers somewhat obliquely into your schedule, to let them know if you’re in a meeting or not. It’s all part of Microsoft’s own efforts to author some first-party apps to help keep up with the third-party apps found on Android and iOS. But in our tests, Squad Watch really didn’t work. The app asks you to add your phone number, then sends an SMS confirmation code to your phone. From there, you can begin adding your friends—which apparently need to own Windows Phones as well. There are two ways of adding friends: from your “contact list,” as well as directly inputting a phone number. Unfortunately, trying to pull in a list of contacts (from the People Hub) showed me the spinning circle that indicated it was working—then after a couple of seconds, nothing. And though I tried adding my wife’s number directly from the app, she said she didn’t receive a notification. Eventually, it would be nice if Microsoft built location sharing into its Maps application, or possibly into its People Hub. For now, however, we’d recommend staying with Glympse. Squad Watch seems like solid idea, but the implementation seems to be lacking. Why this matters: Microsoft’s first-party apps are usually solid. But pushing out an app like Squad Watch doesn’t quite cut it. It’s certainly possible that the app suffered from some launch-day glitches, however, and I’d certainly like to give it another go.